Dr. Paula H. Imada was born and raised in Pearl City, Hawaii. She attended University of Hawaii at Manoa. During her undergraduate years, she volunteered for Big Brothers and Big Sisters of Hawaii, tutored high school students, and worked as a paraprofessional tutor at a local elementary school. It was during this time that she developed her love for teaching and her passion for pediatric care. After earning a Bachelors in Biology and a certificate in Women Studies degree, she attended Pacific University. At Pacific, she was able to combine her interests in pediatric care with teaching. She earned a Doctor of Optometry and a Masters of Education degree. 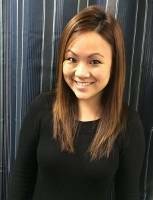 Dr. Paula Imada practices comprehensive medical-based optometry and specializes in pediatric vision care and vision therapy. Hawaii Vision Associates is one of only a handful of practices offering vision therapy and vision rehabilitation services to individuals of all ages on the island of Oahu. With her combined interest in pediatric care and vision therapy, she also participates in community outreach seminars to educate parents and students about the importance and impact vision has upon education and learning. In Dr. Imada’s free-time, she enjoys spending time with her family and playing with her dogs Butters and Penny.